NYC, 05/23/2019, 3:00PM. Boy Erased (2018): Drama With Nicole Kidman And Russell Crowe. 115 min. Director: Joel Edgerton. Starring Lucas Hedges, Nicole Kidman, Russell Crowe. The movie is based on Garrard Conley's 2016 memoir of the same name. 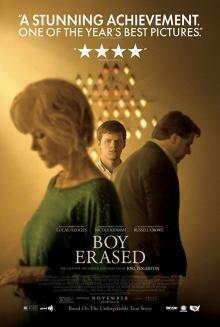 Boy Erased received two Golden Globe Award nominations for Best Actor for Hedges and Best Original Song for Revelation.